Peering down from their home on Mount Olympus, the ancient Greek gods and goddesses see a fast-paced, modern world filled with folks who, gulp, don’t remember them. Holy Thunderbolts! Who will tell their stories? 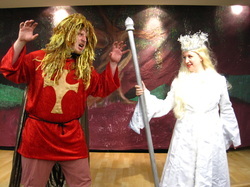 Calliope and Hermes descend from the mountaintop to ask 11-yearold Jason for his help. Join us on this exciting musical journey with Jason to meet Zeus and the rest of the Olympian family and hear their intriguing adventures. Mowgli is a boy who has been raised by wolves in the Indian jungle. When the wolves hear that the fierce tiger, Shere Kahn, is nearby, they decide to send Mowgli to a local "man tribe". On his way to the village, Mowgli meets many animal characters in this musical tale. When Shere Kahn learns of Mowgli's presence, he tracks him down. This exciting new musical full of Music, Dance and Percussion will introduce your students to Rudyard Kipling's Classic Tale. James' happy life at the English seaside is rudely ended when his parents are killed by a rhinoceros and he goes to live with his two horrid aunts. Daringly saving the life of a spider he comes into possession of magic boiled crocodile tongues, after which an enormous peach starts to grow in the garden. Venturing inside he meets not only the spider but a number of new friends including a ladybug and a centipede who help him with his plan to try and get to New York. This exciting musical brings Roald Dahl's book to life for your students. And, teaches the life lessons of loyalty and friendship. This new musical adaptation is the story of a fourteen-year-old boy growing up in the heartland of America. This musical version of Mark Twain's novel is set in 1840 in Hannibal, MO, a bustling town on the banks of the Mississippi River. In the course of the story, Tom matches wits with his stern Aunt Polly, falls in love with the beautiful, feisty Becky Thatcher, and goes on the adventure of his life with Joe Harper and Huckleberry Finn . Along the way he meets a terrifying villain named Injun Joe, and a wayward Muff Potter. In the end, Tom learns who to trust and how to become one the noblest characters in literature. The Fabulous Fable Factory tells the story of Monroe; a 12-year-old boy who wanders into an abandoned factory and accidentally trips a lever activating the living factory of fable creators. The factory owner, Aloysius A. Aesop, explains that the factory has been idle for 2000 years because it is missing the most important part, a “Moral Maker.” This musical adventure follows Monroe as he helps the fable makers re-create some of Aesop’s most famous fables, such as “The Ant and the Grasshopper,” “The Tortoise and the Hare,” and “The Lion and the Mouse.” An enjoyable show for the young and the young at heart. The bright and charming songs will intrigue the students and the morals will invite thought and discussion. 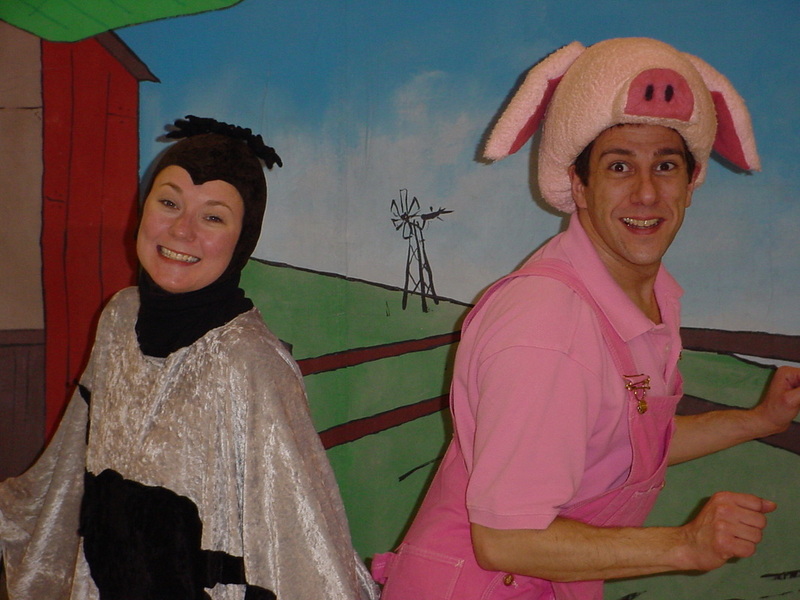 Charlotte’s Web is the story of a pig named Wilbur and his friendship with a spider named Charlotte. When Wilbur is in danger of being slaughtered by the farmer, Charlotte writes messages praising Wilbur (such as "Some Pig") in her web in order to persuade the farmer to let him live. This is a beautiful, knowing musical about friendship that will give your students an opportunity to see one of the best children's books of all time come to life! This new musical version of C.S. Lewis' classic, set in the land of Narnia, faithfully recreates the magic and mystery of Aslan, the great lion, his struggle with the White Witch, and the adventures of four children who inadvertently wander from an old wardrobe into the exciting, never-to-be-forgotten Narnia. This story of love, faith, courage and giving, with its triumph of good over evil, is a true celebration of life. American Eagle brings the classic characters of Winnie the Pooh, Piglet, Rabbit, Kanga, Roo, Tigger, and Eeyore to life in this quaint musical that brings A.A.Milne's to your students in their original form. These characters re-create three of the classic Pooh tales as you orginally read them as a child. Students will be engaged by the words, music and dance as we pay tribute to this eloquent author.